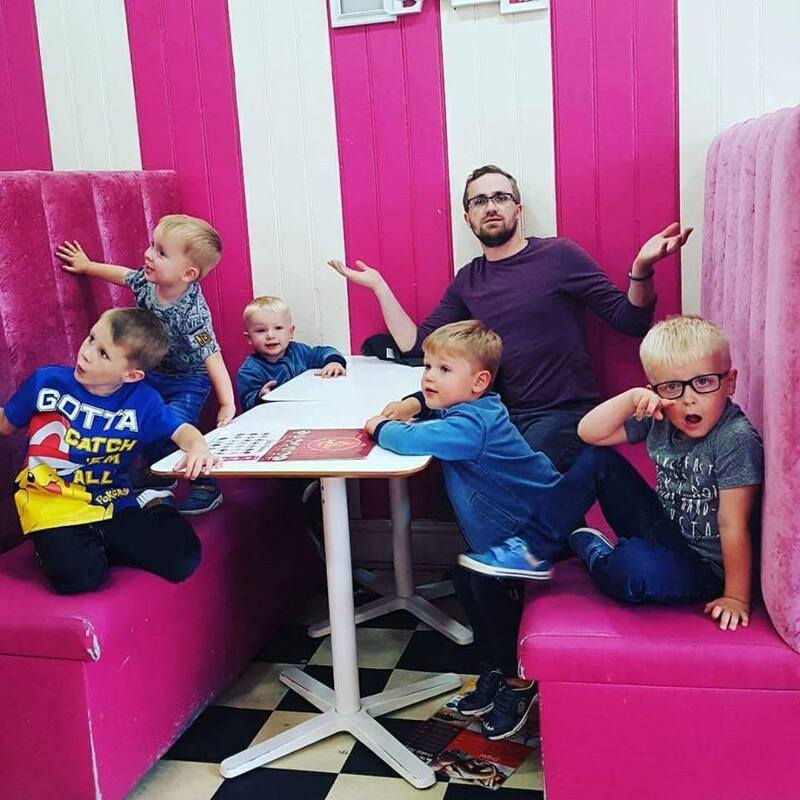 The thing about having very young kids is that it can be hard to get round to doing some of those things we really want to do, as many of you with will know. 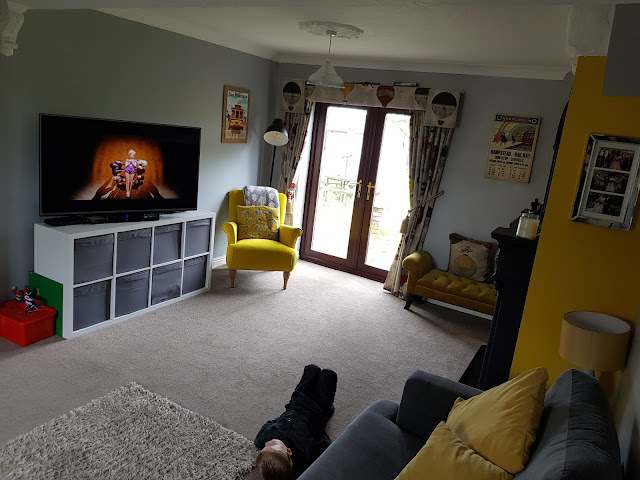 With a two year old and a four year old it has been tough for my wife and i to find the time to even consider redecorating some of the rooms in our home. The reasons why we haven't got round to decorating most of the room in our home is manly down to illness, a busy social life and the fact that we are very very tired all the time. For those of you that don't know, we moved in to our home three years ago and every single thing needed work; the floor, boilers, radiators, wall paper, kitchen, roof, garden... you name it we had to do it basically! 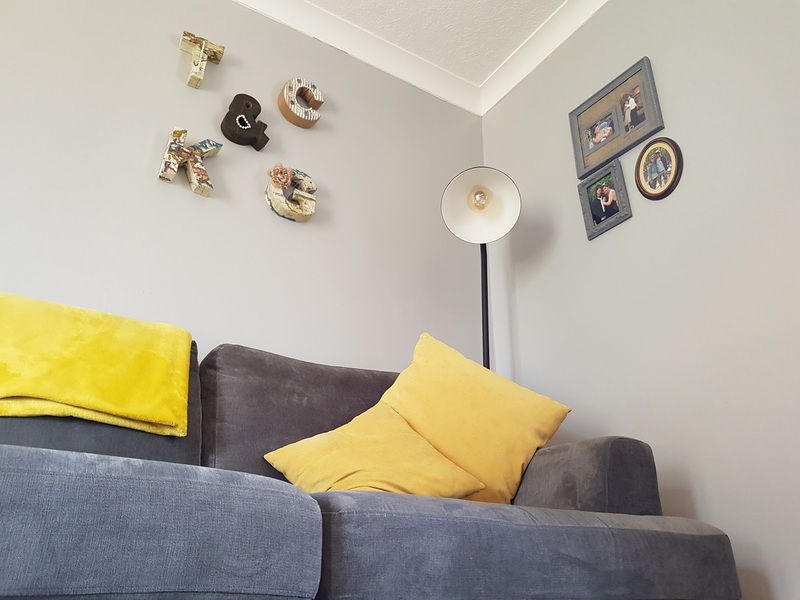 In recent months we have finally added the essential finishing touches to our living room and i am now ready to share our hardwork and some of our favourite features with you kind folks. As a vocal point for our living room we want a piece of furniture that stands out and complements the room's decor. 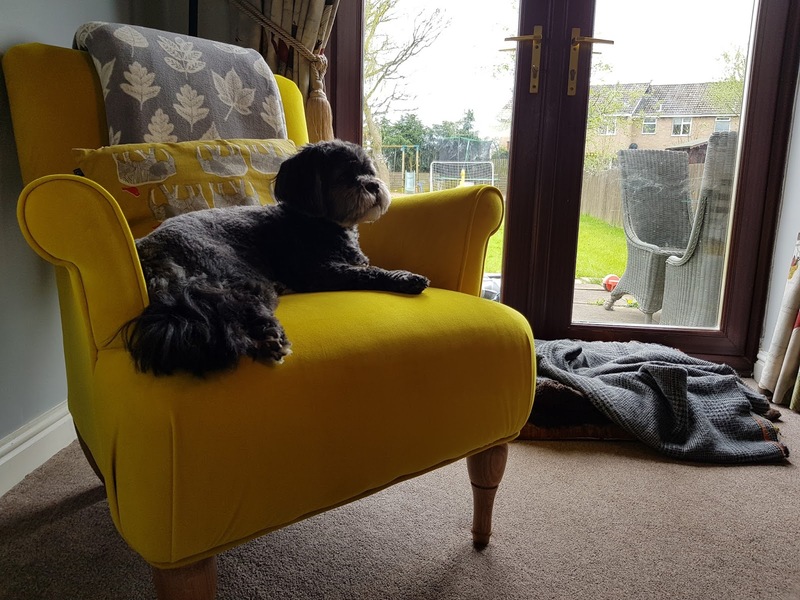 Working with Harveys we selected the exquisite Mallow Accent chair in buttercup yellow from their MODE range. Why? 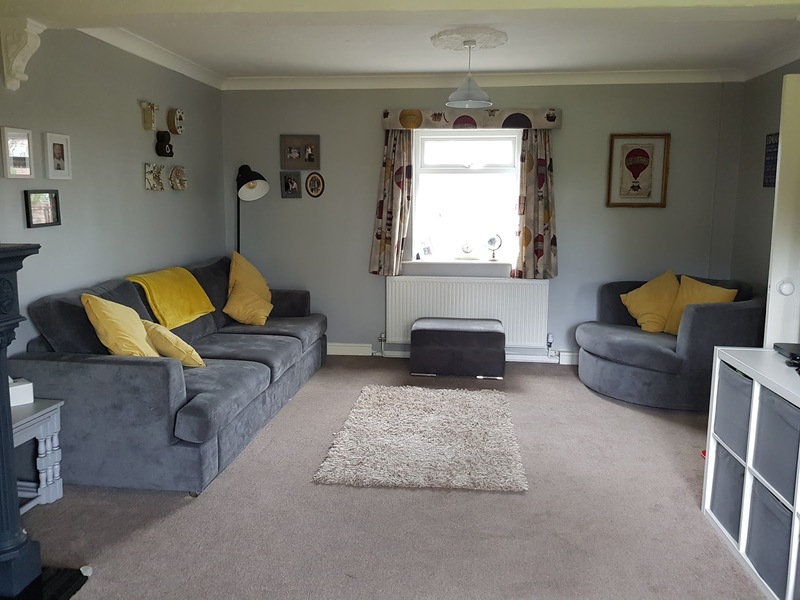 Simply because we wanted a statement piece, somewhere we can sit and read, chill our relax in the sun or under the lamp shade. The Mallow chair provide us with a stylish, modern and some character in a previously unused space. 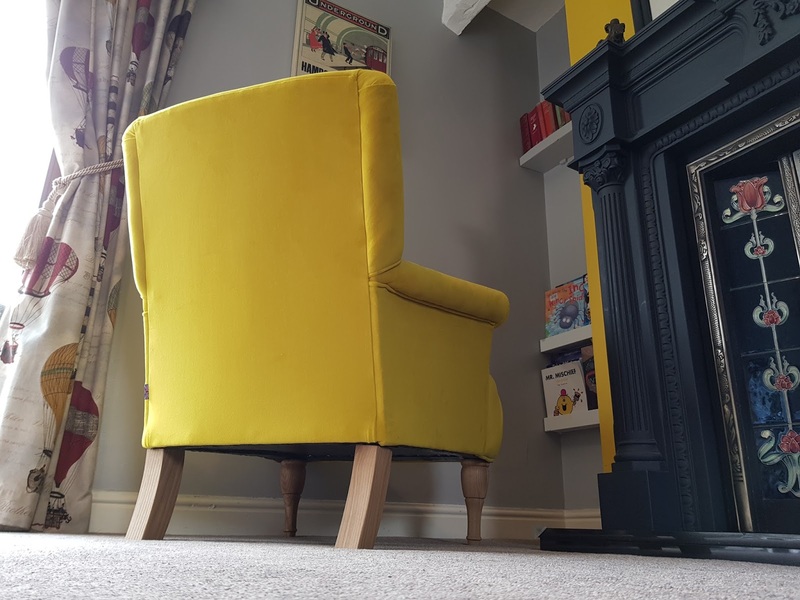 The Mallow Accent chair retailing for £589, what do you get for your money? 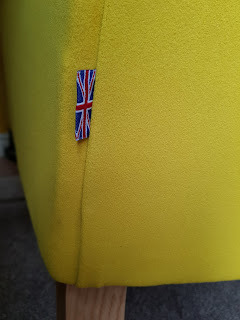 A quality made, a functional and hard-wearing arm chair delivered to your door at at time and day that best suits you. The chair is made right here in the UK and features fully reversible seat and backs. 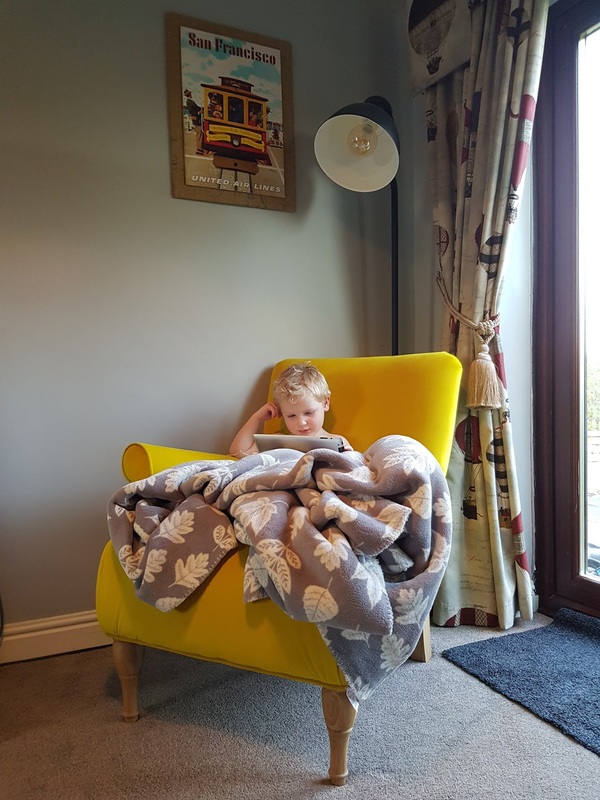 The arm chair is soft, wrap with Soho Fabric interior with a fibre topper and base adds extra comfort and squish factor. 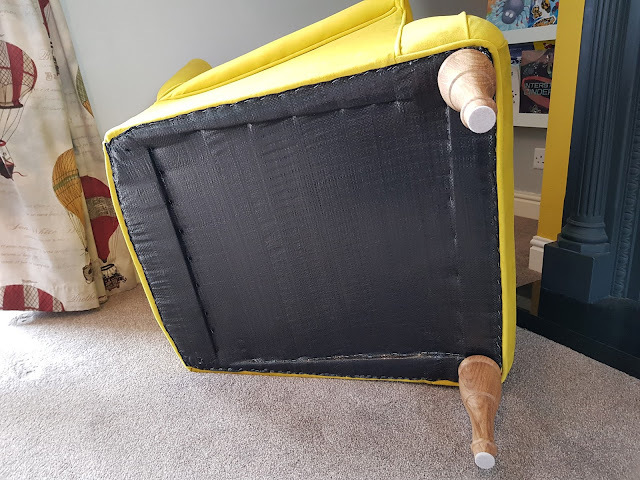 I can honestly say that the chair comfort matches the price tag. 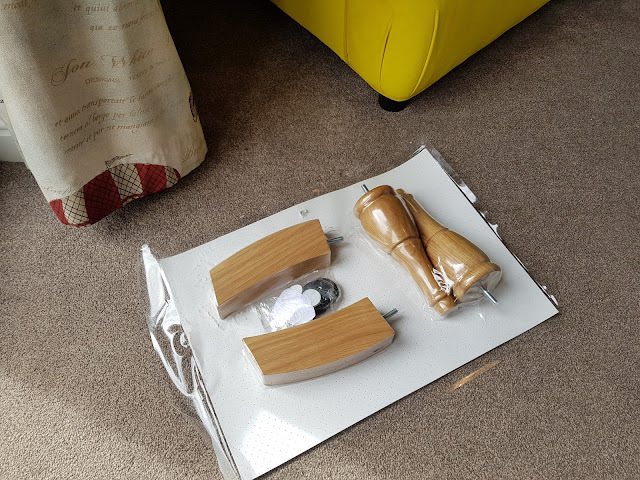 The chair came well wrapped and was protected by bubble wrap and clingfilm. We had no issues getting it through our internal doors, sometimes you do worry about the size of furniture and squeezing it through and all sorts of angles. Setting the Mallow Accent Chair up was done in a matter of minutes, as all we had to do was to screw in by hand the hour chair legs. 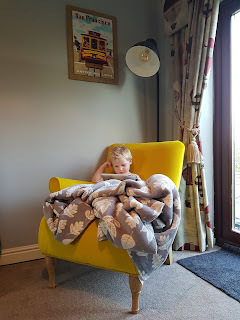 We all love the chair and it has made such a little space and unused space in to a much used space and a place we can all go to relax, read and for me sometimes blog. 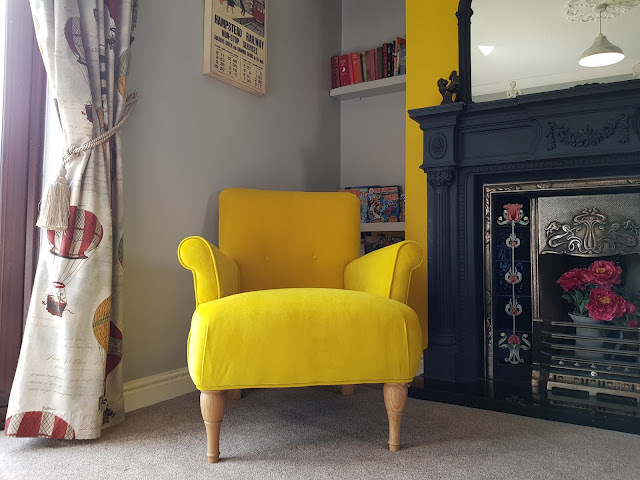 So as you can see in the images we have done more than just add the Mallow Chair to the room. 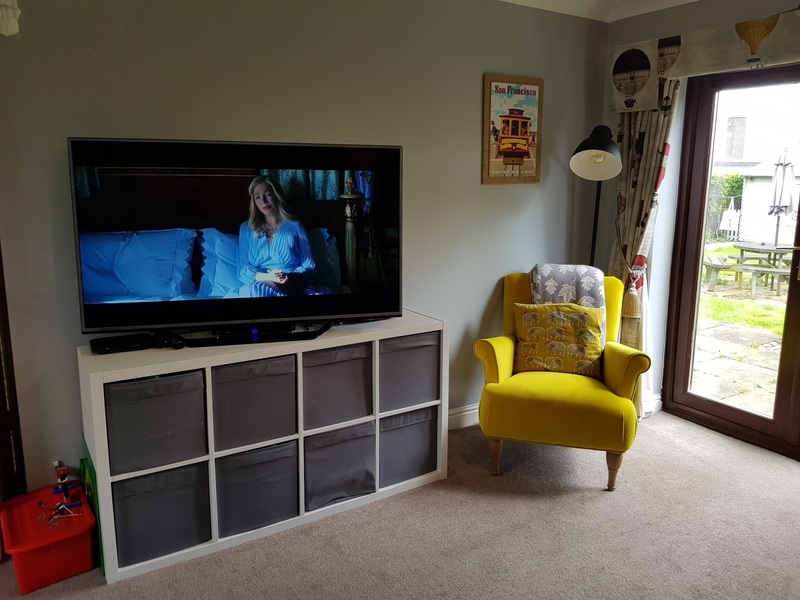 We have spent our own time, energy and money on refreshing this much loved room. The colour scheme was one of the biggest changes as previously we had a very understated duck shell green. 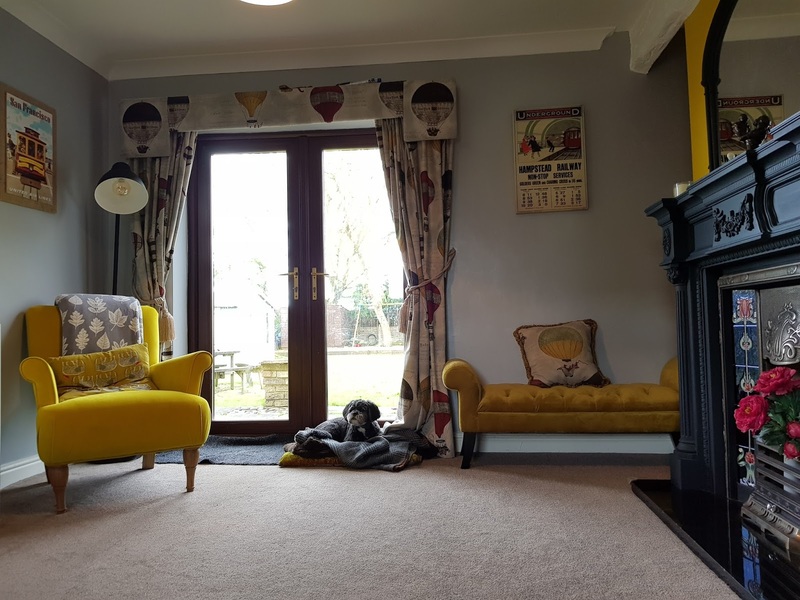 Now we have a chic grey, underpinned with a touch of mustard yellow and i have to confess i really really wasn't a fan of the yellow at first. 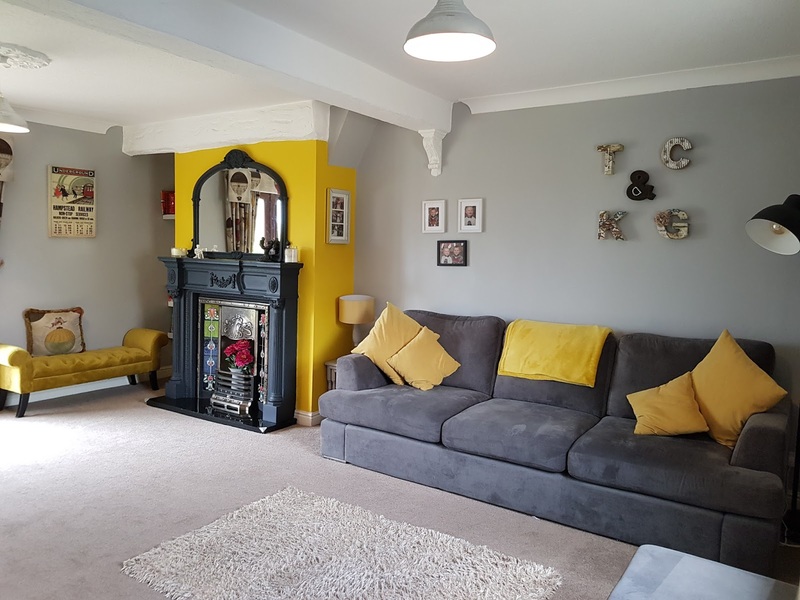 But i begrudgingly i have warmed to the colour and have almost grown accustom to the feature wall and cushions we have. One of the original features of our home is the fire place, as we have kept in the 90's tiles and surround. 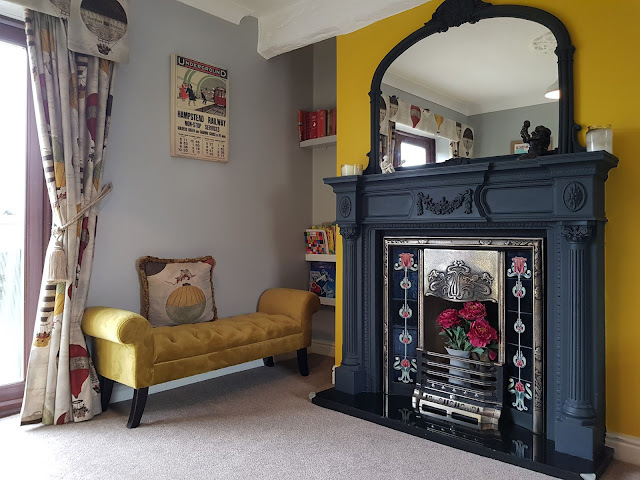 Whilst we haven't got any heating within the fireplace one of the next things on our to do list in the room is to install a coal and or log burner. We currently have logs stacked inside and a decorational flower to make it look sweet and to keep it warm more importantly. We invested in a chaise long a couple of months back as well thought it would give us a little bit more options when it came to seating in the room. The kids love to lay down and play with their books, lego and sometimes nap. We were was keen on having two large lamps brightening the rooms, so we have one placed at opposite ends of the rooms; One directly behind the Mallow chair and the other next to sofa, both providing a good beam of light in prime lounging zones. My wife is a wee bit crafty and has created picture frames, lettering and photo-frames to match the new look of our room. Whilst we are in no rush to get the above amends done, we are going to work our way through the list as and when we have the finances to do so.